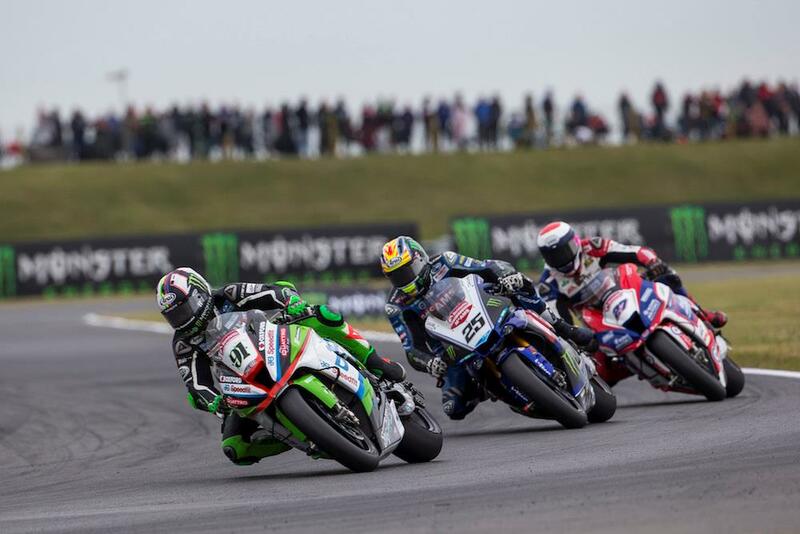 Leon Haslam held off a hard charging Jake Dixon and Josh Brookes to take an important double victory in the second Bennetts British Superbike race at Snetterton this weekend. The JG Speedfit Kawasaki star pipped Dixon to the win by just 0.040sec after a colliding with Josh Brookes on the home straight after the Aussie made a last gasp pass for the win at the final chicane. Having taken a big step forward with the McAMS Yamaha team this weekend, Brookes took the early lead ahead of Suzuki’s Bradley Ray and RAF Regular and Reserves Kawasaki’s Jake Dixon with race one winner Leon Haslam and Be Wiser Ducati’s Glenn Irwin close in tow. Just a second covered the top five heading into the two thirds point as Haslam moved ahead of Ray and in to second as Ray, Irwin and Dixon scrapped for the final podium spot. Irwin looked to have the pace but his race came to a premature end as a close battle with Ray resulted in both riders in the gravel after Ray tucked the front, collecting Irwin, at the same corner he’d crashed earlier in the day. Haslam passed the Yamaha of Brookes to take the lead on lap 11 but the duo were matched on pace until the end with Brookes leaving it until the last possible moment to make his move at the final chicane. Heading in tight, Brookes tried to get the drive down the straight but a collision with Haslam allowed Dixon to draft past but it wasn’t quite enough for the young gun who took second to the JG Speedfit Kawasaki with Brookes a despondent third. Dan Linfoot came out best in a three-way battle for fourth to take a strong result as he returns from injury while Danny Buchan and Peter Hickman rounded out the top six. The surviving Buildbase Suzuki of Richard Cooper crossed the line seventh ahead of Tyco BMW duo Christian Iddon and Michael Laverty with rookie Andrew Irwin completing the top ten. Having taken his fifth win in a row, Haslam now leads the series standings by 64 points over non-scorer Ray with the absent Shane Byrne still third. Jake Dixon’s double rostrum sees him move fourth ahead of Glenn Irwin with Josh Brookes moving into the top six for the first time this year at Jason O’Halloran’s expense.